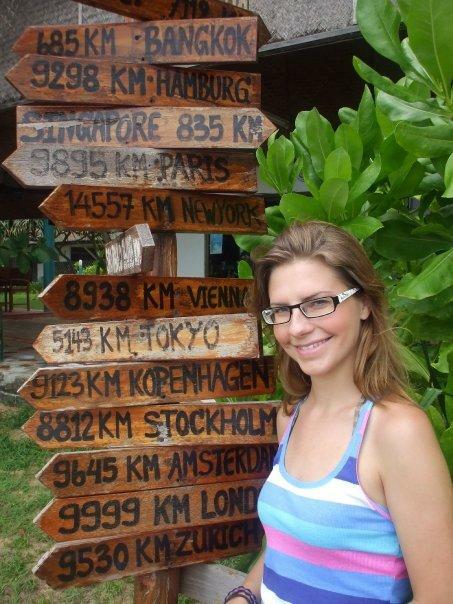 Koh Lanta is a long island with beautiful beaches running down it's western coast. Because it is the low season, everywhere was very quiet. We found a nice place to stay and rented a bike to explore the island better. I have never ridden a moped before but the roads here are so quiet I felt comfortable trying for the first time. We rode up away from the beaches and into the hills for some spectacular views of the coast and the other small islands nearby. Then we rode down along one of the most beautiful stretches of coastal road; great fun to drive along! The downside to Koh Lanta was the weather. Our time there was broken by rain showers and storms. Lisa has found a love for a Thai dish called Rad-Na as well as Massaman Curry. So after a few days we packed up once more and headed back to Krabi Town, howver only briefly as we then made our way to the nearby beach town of Ao Nang.